Ricardo Martinelli in one of his uniforms. Photo by the Presidencia. They are so afraid of my tweets. Look what happened in the Arab Spring. Do something. Do not allow these acts to remain unpunished. 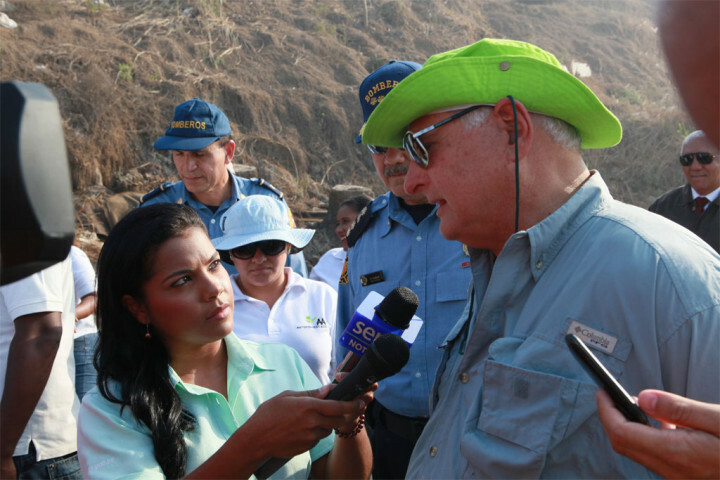 The Supreme Court, having rejected magistrate Hernán De León’s move to throw out the complaint against Ricardo Martinelli in the Financial Pacific case, now has a dozen separate criminal matters concerning Ricardo Martinelli before it. With the acceptance of a case against Martinelli and legislators Sergio Gálvez and Vidal García arising from overpriced government contracts to buy rice, beans and lentils with kickbacks going to the politicians, four cases against the ex-president have reached the formal investigation phase. (On the latest one the three men named will be tried separately if the matter comes to trial, as their interests and alleged roles were different.) But all of the Martinelli cases are bogged down in the face of endless defense motions from teams of lawyers, many of them quite frivolous in a legal system that provides no penalties for vexatious motions interposed in order to delay. The former president is trying to run out the calendar for the investigation process or for the statute of limitations, both of which he shortened for his own crimes before leaving office. Those shorter windows of criminal liability are now under constitutional challenge before the high court, which is taking its time deciding the issue. Martinelli appointed a majority of the magistrates and suplentes (alternates) on the Supreme Court of Justice. As two magistrates have been removed — Martinelli appointee Alejandro Moncada Luna was impeached and sent to prison for a small sample of his corrupt acts and Martín Torrijos appointee Víctor Benavides was forced to resign in the face of wealth whose provenance he could not explain — President Juan Carlos Varela could appoint replacements for both the magistates and their suplentes at any time. Were such nominations to be approved by the fragmented National Assembly, that would numerically end Ricardo Martinelli’s high court majority. At the end of December a third vacancy will be created as the 10-year term of Torrijos appointee Harley Mitchell ends. The math is not that simple and the mood swings in Martinelli’s incessant Twitter tweets about the court reflect the complications of both the court and his mind. At some points Martinelli, who is reportedly holed up in a condo on Brickell in Miami that was used as a set in the gangster movie “Scarface,” boasts about how everything is under his control, how he will never be tried or convicted of anything. At other times Martinelli tweets about how Varela has the entire court bribed or browbeaten to the point that he wouldn’t have a chance before Panamanian justice even if he’s innocent. And then, through Twitter, through his television station NexTV, through his newspapers La Critica and El Panama America and by way of a small entourage of rented voices still on his payroll, Martinelli continues to play party boss and even tends to put on airs like a revolutionary. Enough is enough, say the great majority of Panamanians who do not have a personally vested interest in politicians getting away with whatever heists they pull off. But Panama’s system is designed to minimize public influence over public policy in the five-year spans between elections. So what if 26 civic organizations, many themselves umbrella groups of multiple organizations, call for an end to impunity? So what if Magaly Castillo, an attorney and veteran anti-corruption activist with close working ties to the Catholic Church, calls for an end to the mockery? She, and they, have been ignored before. Business turned against Martinelli. We can see where some of the exceptions like Nicolás Corcione and Aaron Mizrachi have fled, and where a bunch of others are in big trouble with prosecutors for their dealings with Martinelli. The American Chamber of Commerce would not criticize Martinelli then and the guy who was urging American business owners to donate to Martinelli? He has fled the country. But by and large business found the conditions that Martinelli created intolerable, and at the head of the capitalist revolt against the former president was the country’s richest family, the Mottas. Because of Panama’s campaign finance secrecy we don’t know how much they gave to the Varela campaign but it was reputedly a considerable sum and Alfredo Motta very notably led an independent campaign for Varela. And there at the press conference, sitting beside Magaly Castillo and calling for Varela to appoint replacements for the disgraced former magistrates and their suplentes, to veto legislation that would increase politicians’ privileges and immunities, to speed up the legal system and to bring Ricardo Martinelli before the bar of justice, was Alfredo Motta. The Mottas have their interests and their critics. If you follow La Estrella closely enough, you will notice many allegations and arguments in favor of the proposition that they have too much influence over the Varela administration. But there you have it. The president isn’t just dealing with the usual pesky good government advocates that his predecessors have successfully blown off. This crowd includes key supporters of his. To the extent that Varela’s Catholicism is a big part of what makes him tick — something that is by most accounts the case — and to the extent that Castillo unofficially but authoritatively speaks for the church, the call matters. This was not the usual civil society pronouncement. Cynics might dismiss Alfredo Motta by arguing that what his family wants is a port concession on the Pacific Side, but it that may well be true, bugging the president about a sensitive matter might not be the way to lobby for it. On his Facebook page, Motta put it this way: “We have come to the time to change the country’s direction and to take the path of transparency and honesty.” Look at where Panama has just been and where we are headed in the near future, and it sounds more like a business argument than a moral one.